Loose skin can happen in otherwise very healthy and fit people due to childbirth and aging. Laser body skin tightening is ideal for problem areas that are difficult improve, even with intense exercise and strict diet. 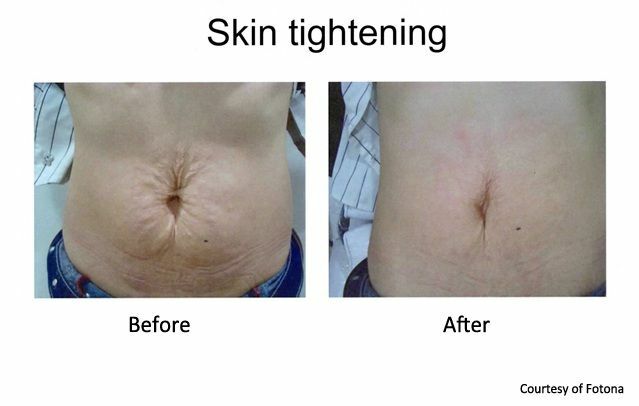 Laser skin tightening can be applied to areas of loose skin such as the abdomen, thighs, buttocks, arms, neck, back, decolletage, and breasts. Laser treatment can be used for moderate non-surgical fat reduction for areas such as the buttocks, arms, obliques (sides of the lower back), and thighs. Improvement of moderate cellulite, and smoothing of rippled and bumpy skin from cellulite in areas such as the buttocks and the back of thighs can also be done with laser treatment. 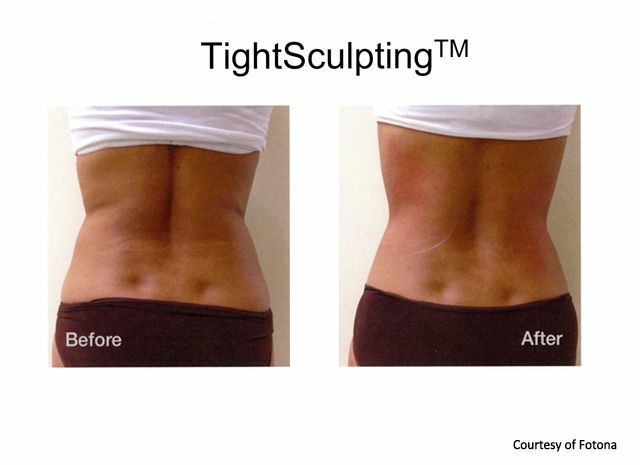 The original standard of laser skin tightening (in the early 90’s) is fully ablative treatment – light and heat energy applied to fully or partially remove layers of skin (epidermis) and transferring heat to the backbone of the skin, or the dermis, which forms the support structure of the skin. When the target temperature, between 43-50 degrees celsius (depending on the individual patient) of controlled heat reaches the dermis, the dermis contracts. The dermis responds to this heat as an injury, and reacts with a healing response by producing more collagen. With a little recovery time, the outer skin layer (the dermis) is replaced by a fresh new skin layer, supported by new collagen generated at the dermis for a fresh, visible youthful skin texture. The tightened dermis gives the skin the tautness of younger skin. 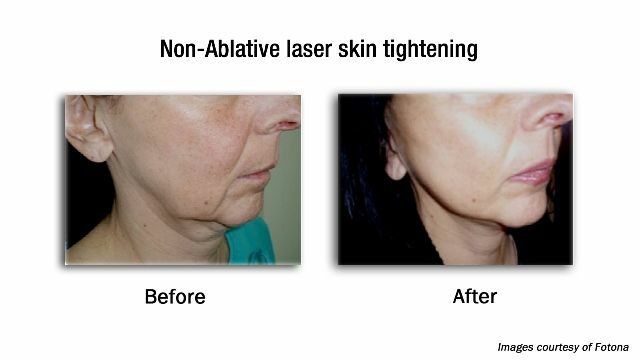 Non-ablative laser skin tightening uses beams of energy to penetrate into the deeper layers of the dermis without ablating the outer layer of the skin (epidermis). 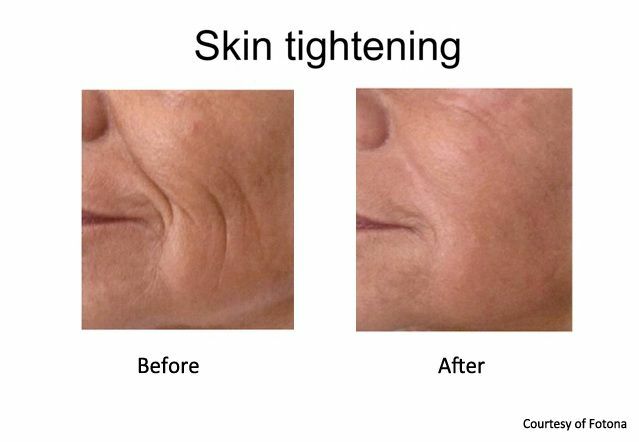 While results may not be as significant as fully ablative treatment, non-ablative skin tightening can create impressive results making the skin more smooth with less recovery time. This option is more practical for people needing to go back to work in about 1 week or before an important event such as a wedding. Non-ablative skin tightening can also be the best option in summer months when more direct sun exposure and heat can cause the exposed dermis from fully ablative treatments at greater risk of hyperpigmentation. Non-ablative procedures including non-surgical skin tightening for areas such as neck and buttocks, but without the downtime. Longer exposure of non-ablative laser settings can also be used for non-surgical fat reduction, while keeping outer skin layer intact in the process. The neck is an important part of facial rejuvenation, but is often overlooked. 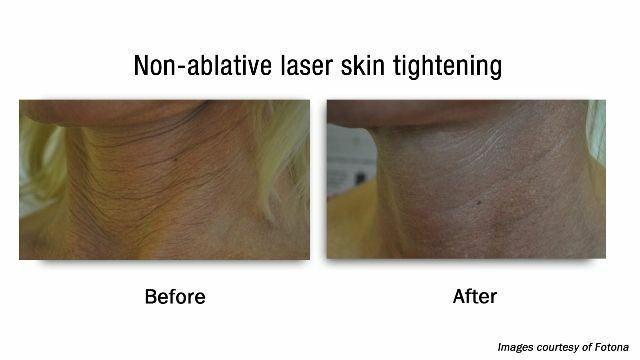 The neck is prone to several aging and body changes that can be treated with lasers. Neck skin can be thinned and loose, which leads to lines around the neck, to skin hanging from the chin area. The application of thermal energy can tighten the dermis and and generate collagen at the neck, resulting in a firmer, tighter look, with improvement in deep lines and a smoother texture. The heat from the laser treatment induces a collagen response in both fully ablative and non-ablative settings in the neck area to tighten the backbone of the skin at the level of the dermis. 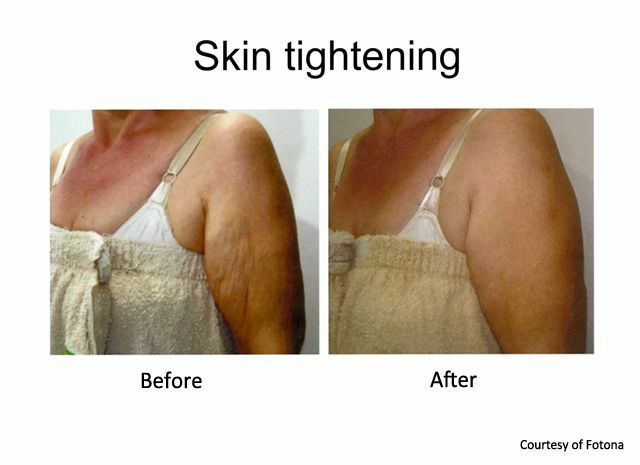 Tightening does provide a mild lifting effect for the neck through dermis contraction. The neck area below the chin has a tendency for accumulation of fat, which leads to a common issues like a double chin. Depending on the amount of fat in this area, fat can be reduced with the laser. 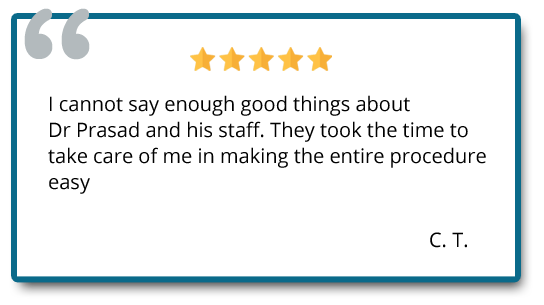 The difference here from an regular skin tightening laser treatment is that the laser is held in the same area for a longer period. The fat below the dermis can absorb heat better than the dermis, so longer exposure helps with fat reduction. However, it is important to note that laser fat reduction is best used for moderate fat for toning and sculpting, and is not recommended as a weight loss treatment. Loosening of the dermis due to aging and sun exposure can affect the decolletage area of the lower neck and upper chest. Skin in this area can be first reddened through longstanding sun exposure, and skin can start looking rippled, wrinkled, and blemished. 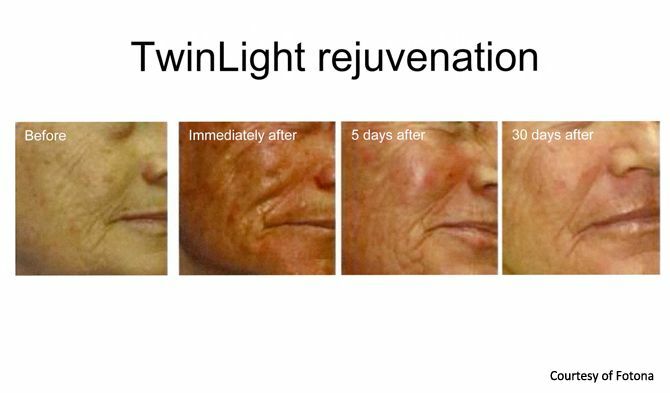 Laser skin tightening, often coupled with platelet-rich plasma (PRP) treatment, can help with reduction of wrinkles, lightening discoloration, as well as skin blemishes like age spots due to sun exposure. New collagen can be generated in the decolletage through the body’s response to the heat of the laser, with another collagen induction effect by using the growth factors of PRP injected into this area. Non-surgical rejuvenation of the decolletage is ideal for women who want and elegant, more youthful look readily complemented by any fashion choice. The breasts can be affected from stretch marks from pregnancy/childbirth/breastfeeding and the effects of aging. Visible stretch marks are the result of the increasing laxity of the dermis due to enlargement of breasts in lactation, which reduce again when milk production is reduced. Larger and heavier breasts in women who have not gone through childbirth can also show stretch marks even if they never had children. Laser treatment of this area can cause the underlying dermis of the breast skin to contract and tighten, and produce more collagen to reduce visible stretch marks and give slight lifting effect to the breasts. After the face, the arms and legs are often where people notice your skin, with fashion and function putting full skin focus on your extremities. The often uncovered arms and legs are subject to skin damaging sun exposure, and often carry extra fat in people who are overweight. When weight is lost, visibly sagging skin can be carried in the limbs, and can appear noticeably loose and rippled. The effects of aging with the loss of skin tone can also appear at the extremities. Loose skin of the legs can have a moving ripple when walking, and can be visibly lax even when stationary. Loose, rippled skin of the arms can be treated quickly and safely, with little recovery using a wider laser scanning attachment. The skin of the arms can be tightened quickly and safely with the same laser handpiece as the face, for a smooth contour, and tautness to the touch. The wider area of the thighs can be treated with a wider laser scanner attachment to reduce overall treatment time. Tightened skin of the thighs also reduces the flapping movement of loose skin when walking about. Stretch marks, or medically termed as striae distensae, are the result of the loosening of the backbone of the skin, or the dermis, resulting in visible streaks or stripes on the skin surface. Stretch marks have various causes, from the stretching of the abdominal skin due to childbirth, post-weight loss in various parts of the body, and at the breasts as mentioned previously. Stretch marks from post-pregnancy and weight loss can be treated non-surgically, and quickly with non-ablative laser, usually over three sessions. Treatment of stretch marks entails tightening the dermal layer, right below the surface skin layer. Tightening of the dermis also contracts the surface skin layer, closing the visibly stretched gaps at the skin surface. Treatment of stretch marks will likely take more than one treatment session. Non-surgical fat reduction can be done safely with gradual heating using the ND:Yag laser. Advancements in laser technology such as greater heat control, a more gradual raising of temperature, and full range of customizable beam width are essential to prevent damage to the skin and the layer of fat that provides youthful volume. Fat generally absorbs more heat than the outer and inner layers of the skin, so heat must be monitored during fat reduction treatment to ensure no damage to the skin layers. The doctor’s skill with the laser and knowledge of anatomy are crucial in preserving an essential fat layer while reducing excess fat. The essential fat layer provides skin cushioning, youthful volume and suppleness, and also channels nutrients to the skin for overall skin health. Laser fat reduction is highly cautioned and should only be done by the most experienced doctors. Laser fat reduction requires longer beam exposure than skin tightening or laser resurfacing treatments, and reaching and treating the underlying fat requires a surgeon’s knowledge of internal anatomy. Laser fat reduction is not a procedure that should be done by aestheticians and technicians who mostly deal with surface skin layers. Reduction of too much fat and/or overexposure of lasers can lead to pain, burning of the skin, and essentially cooking the fat. 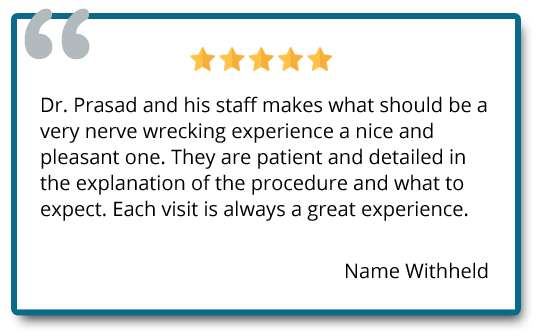 Excess laser fat reduction also damages the skin, and the skin’s ability to draw nutrients from the essential fat layer, so having this procedure done with a knowledgeable surgeon is critical in avoiding complications. EXCESS HEAT FROM A DEVICE CAN “COOK” THE ESSENTIAL FAT LAYER, WHICH PROVIDES THE SKIN SUPPLENESS AND YOUTHFUL VOLUME, SO IT IS CRUCIAL TO PREVENT EXCESSIVE FAT REDUCTION IN HEATING DEVICES Y GOING TO A REPUTABLE AND EXPERT DOCTOR. Limited cellulite reduction and tightening of its affected skin can be done on larger areas of the body such as the thighs and buttocks. 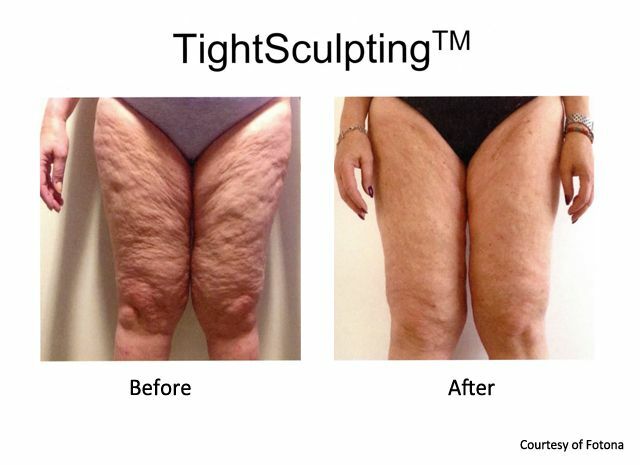 Mild cellulite on the buttocks and the thighs can be treated with a combination of laser tightening for dimpled and rippled skin caused by cellulite, and the reduction of the fat that causes cellulite. Non-surgical laser reduction of cellulite is limited to mild to medium cases, where treatment is focused on improving rippling and irregularities of the skin’s surface, and reduction of mild cellulite. Laser cellulite treatment also requires other procedures such as massage, and additional laser light therapy outside of the Nd:YAG laser. Most non-surgical laser treatments can be performed quickly (even over your lunch hour), with options for little to no downtime for recovery. 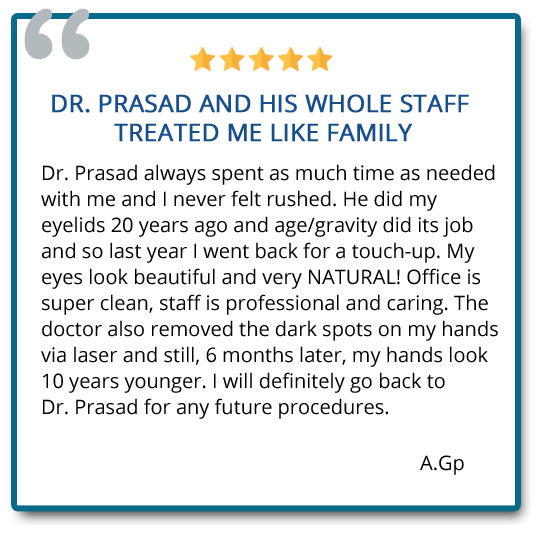 Schedule your appointment today by filling out the contact form below, or by calling (212) 265-8877 for our Manhattan location, or (516) 742-4636 at Garden City, Long Island.